Speaking of nostalgia, here’s Transformers Armada Super Base Optimus Prime. This is actually somewhat kind of sidewaysish important, because this is the toy Ethan was looking for in the Shortpacked! flashback sequence where he first met Amber and faced down her father. So if you want to get a grasp of how the Walkyverse timeline is ordered up, that’s happening at roughly the same time as this. If he said that in Catman’s voice I bet no one would take him seriously. Hey now, Catman turned into a halfway respectable supervillain/anti-hero in the late 2000s. 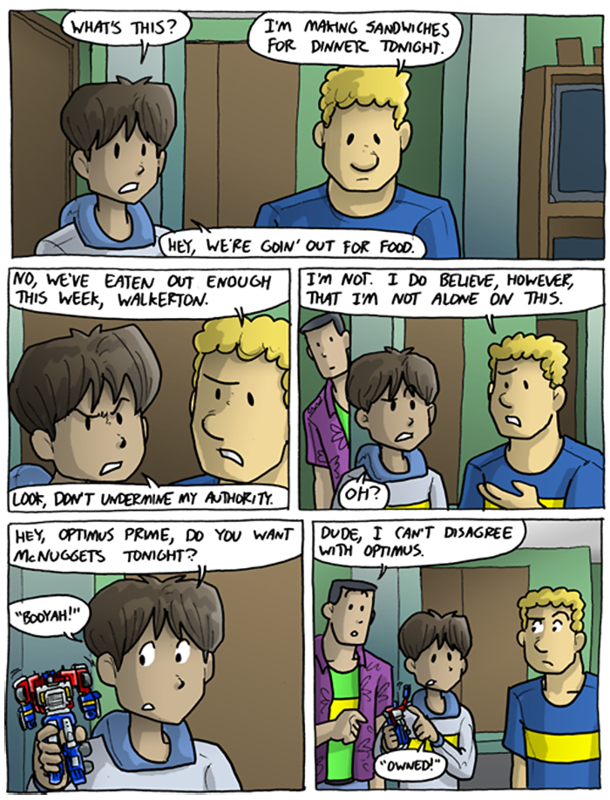 I could see this working on me, depending on how good Walky’s Optimus voice is. Peter Cullen could tell me to jump off a roof and I’d probably be halfway down before I thought to question it. He got me to see four Michael Bay movies…FOUR…before I came to my senses. And be honest, you’re still probably gonna see the fifth. At this point, I kinda doubt it. 1st and 2nd I saw in theaters, 3rd and 4th I only rented. It’s the Armada era, so he just has to do Garry Chalk. How much older than Amber is Mine, then? Tony is making sandwiches. Sandwiches. That includes a lot of neat possibilities like a BLT, a corned beef Rueben, or a Philly cheesesteak. Not a vegetable plate with cottage cheese, or barley soup (and that thick scum which forms on top), or that untrimmed beef with a can of cream-of-mushroom soup as the cooking sauce. I know his appetite is described as somewhat adolescent, Walky really hasn’t got a lot of culinary imagination, does he? It suddenly occurs to me that Semme’s uniform kinda looks like the Fallout vaults one. ooooooh Armada Optimus, that was the first transformer i ever got. It’s more than a little beat up, in fact it is missing one fist, his chest plate/matrix, and the legs from his trailer, but boy do i love it.